The SKYPASS Visa Signature Card currently has an Informr score of 6.3 out of 10. This score is based on our evaluation of 4 sources including reviews from users and the web's most trusted critics. 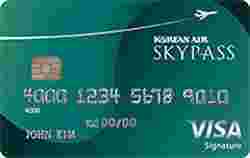 SKYPASS Visa Signature Card is typically available to those with good credit scores (650 or greater). With a mediocre rewards rate and stingy bonuses, the Korean Air SKYPASS Visa Signature card ranks low on our list of airline cards. This card does not offer any spending categories or high reward rates for your purchases. This then makes it hard for one to justify the high annual fee of $80 if you’re a Korean Air customer/consumer. On Korean Air ticket purchases. Earn 2,000 Bonus Miles at renewal. With so many better options available, we think only a select group of consumers will find the features of the SKYPASS Visa Signature to be worth its price tag of $80 per year. Sub-par rewards rates and limited general use potential make this a hard sell to anyone who is not a loyal Korean Air customer, or frequent business traveler to Korean cities who flies with them multiple times per month.